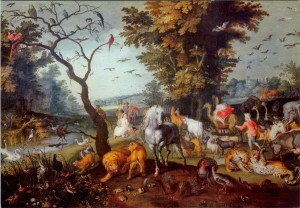 The artist has put the horse in the very center of the painting in a dominating pose amidst all other domestic and wild animals. 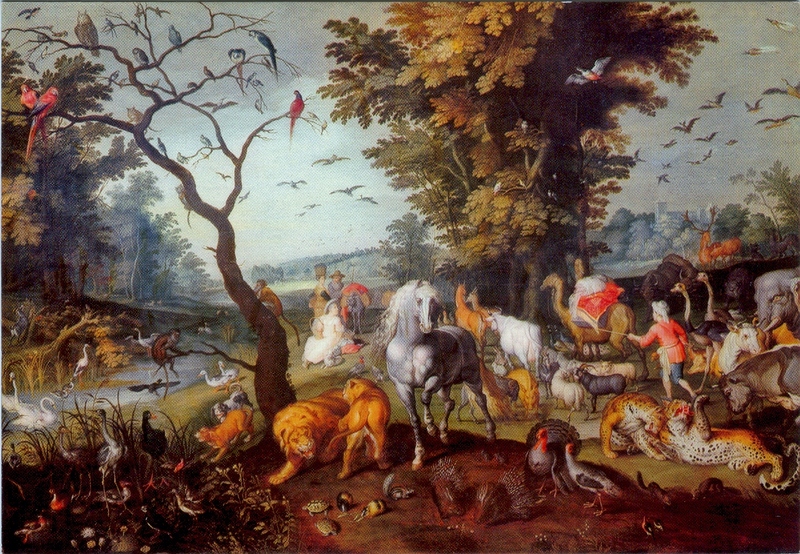 They are led into the ark of Noah in an almost festive procession by the man on the left, but the horse shows itself to the spectator before going with the other animals. This is a most striking example of the special position the horse has in the world of animals and in the human world. Moreover this grey horse emphasizes its presence through an elevated trot, which proves the artist was well aware of this natural gait, which was taught by De Pluvinel in his ‘Maneige Royal’ a few years later in 1623. In the situation of the Low Countries the artist choose a local type of horse, which has the conformation of the Frisian horse. In our time we only know the black Frisian horse, but here we see a grey individual. Paulus Potter also showed an impressive grey Frisian horse on an etching in 1652. This is a very early example of symbolism in a painting. 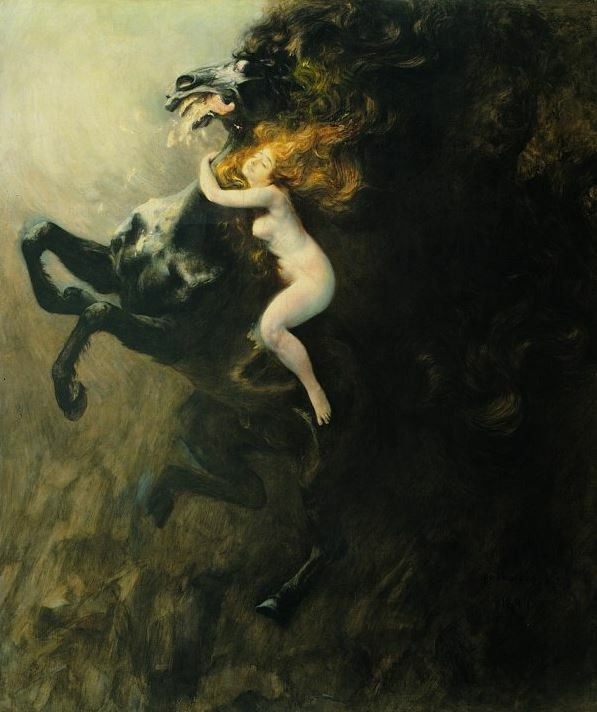 The artist choose to picture a woman and a horse both in a most exulted state of mind. The horse is used to express extreme excitement through its eyes, nostrils, mouth, manes and movement. The woman thoroughly enjoys the situation and clearly shows her exultation. She just manages to ride but needs to sling her arms around the horse’s neck. The artist made a daring symbol of animal and human exultation and it caused much uproar at the Zacheta exhibition in Warsaw on March 18, 1894. In our time we would have been less shocked, but the painting is still fascinating.